Materials: Steel, iron, brass, silver, wood. Scabbard: Wood, cotton, brass, iron. 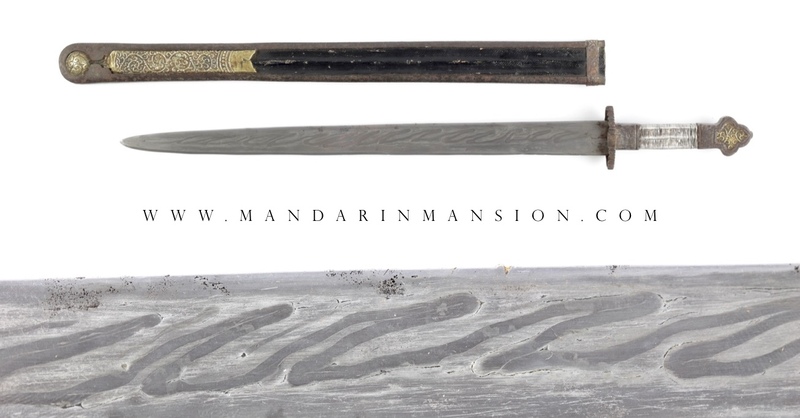 An interesting Tibetan shortsword with very rare blade type with ce rong or "open ravines" pattern of zig-zag lines.1 The blade, with acute tip, is of wedge-shaped cross-section a secondary bevel on the left side. 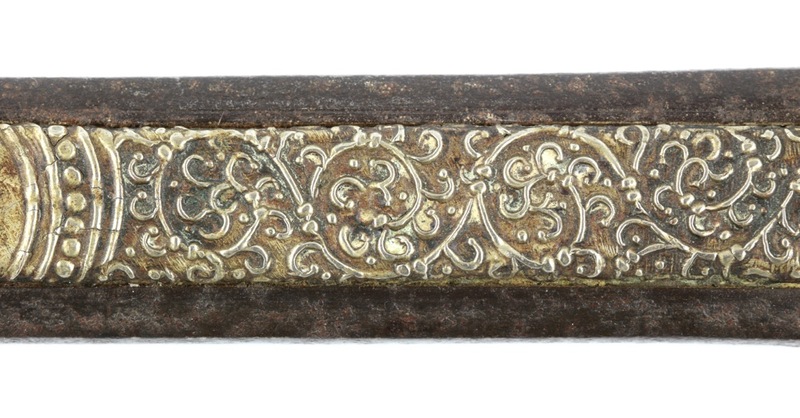 This asymmetrical cross-section is a feature seen mainly on swords associated with the Kham region, eastern Tibet. The pattern is accomplished using rods of so-called "male iron" or pho lcacs and "female iron" or mo lcags that are forge-welded together side by side. 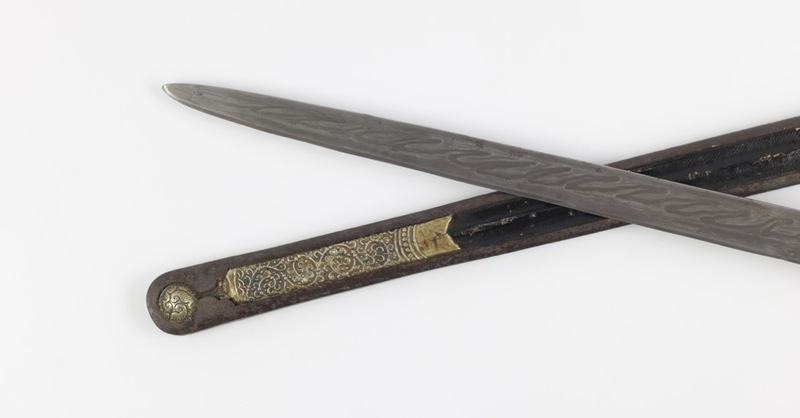 Instead of creating the conventional "hairpin pattern" common on Tibetan swords, the rods on this sword were folded back and forth before welding them together into the blade, creating the zig-zag effect we see. 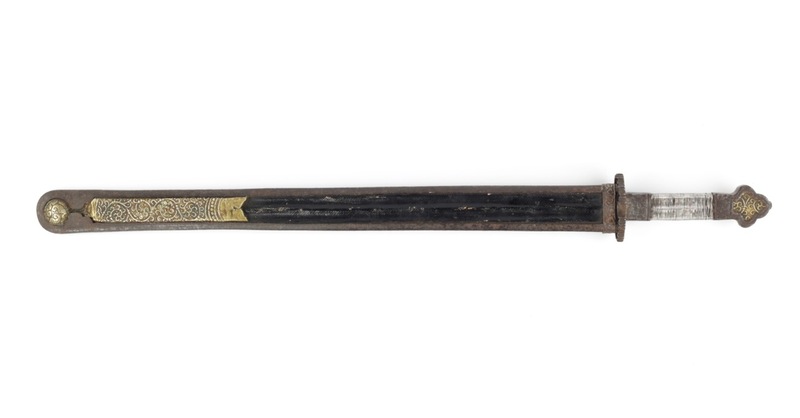 Conventional Tibetan "hairpin forged" blade, exhibiting the rods of cite>pho lcacs and mo lcags side-by-side. In this construction they "stacked" the rods in order to make best use of heat, as opposed to the forge-folding done in most Asian cultures. This was probably because it was much harder to heat up a forge in the thin air of the Himalayas. The ce rong pattern on this blade with folded core rods. 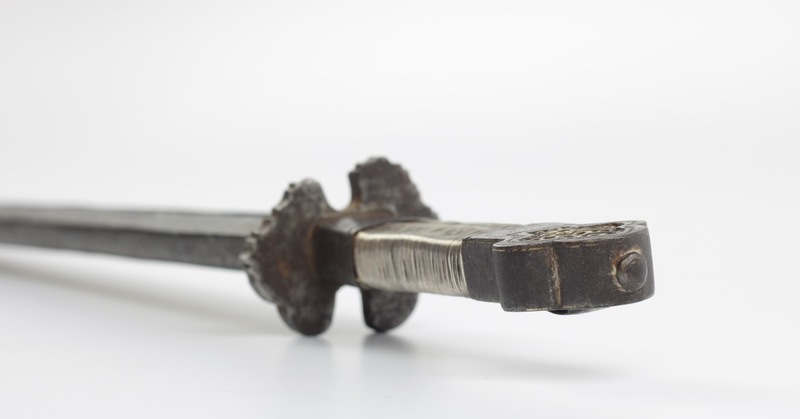 The sword has a classic hilt shape with a rectangular cross-section handle, lobed pommel, and characteristic guard with a shallow standing rim with fluted edges. In the pommel is a window through which a brass plate is visible with scrolling decorations worked in relief, a somewhat unusual feature. 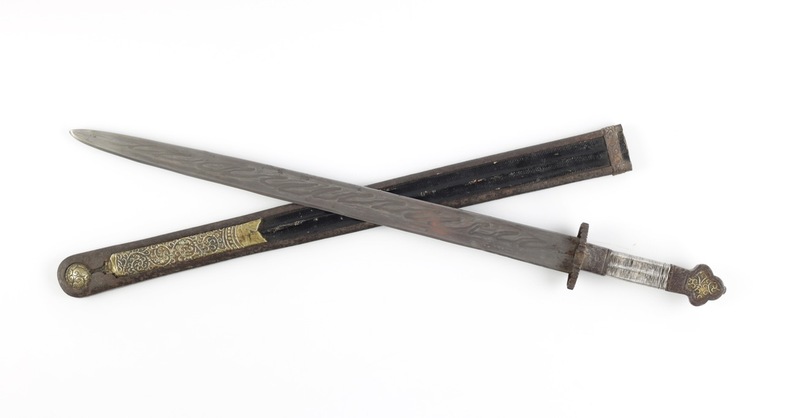 The scabbard is made out of two wooden plates held together by an iron U-frame. 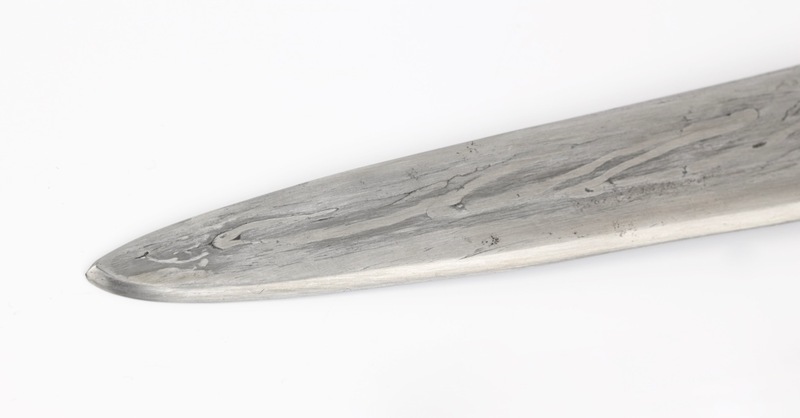 The front plate of the scabbard has two grooves separated by a pronounced ridge, a shape echoed in the geometry of the wooden handle. 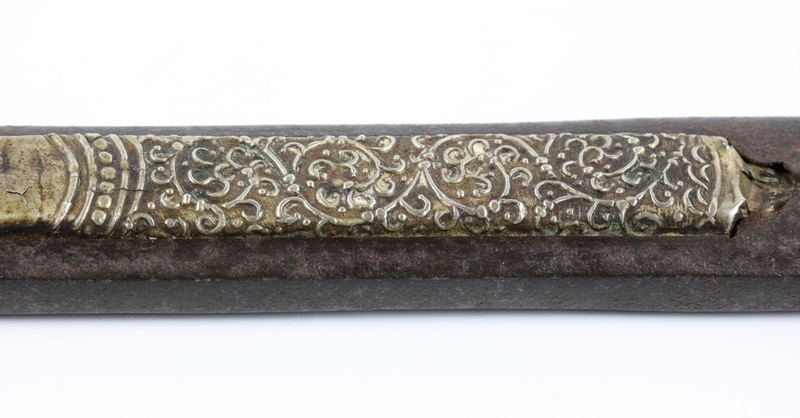 It is covered with black lacquered fabric, partially covered by a brass ornamental plate, expertly worked in repoussé in a similar fashion as the plate in the pommel. The bottom of the frame holds a large silver dome-shaped "wheel of joy" ( dga' 'khyil ), a significant symbol in Tibetan Buddhism. The backside of the scabbard is covered with indigo dyed cotton, turned green over time. The sword came with a broken tip which I re-ground to shape. I also re-wrapped the silver wire on the handle, aged to match. 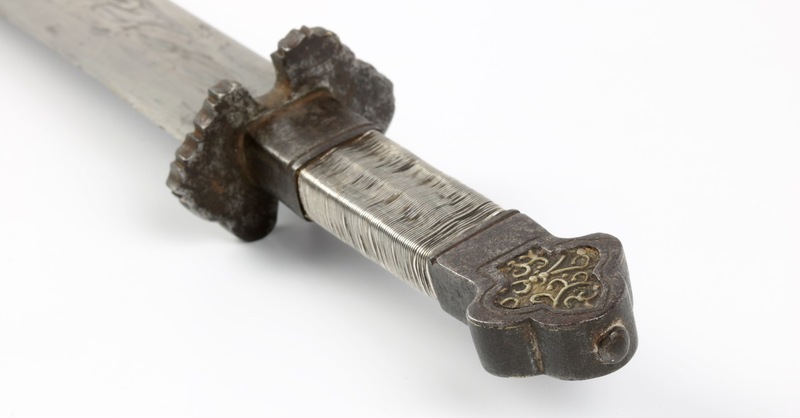 There is a small crack in the brass ornamental plate of the scabbard. Otherwise in very good condition. Hilt is tight, original peening intact. 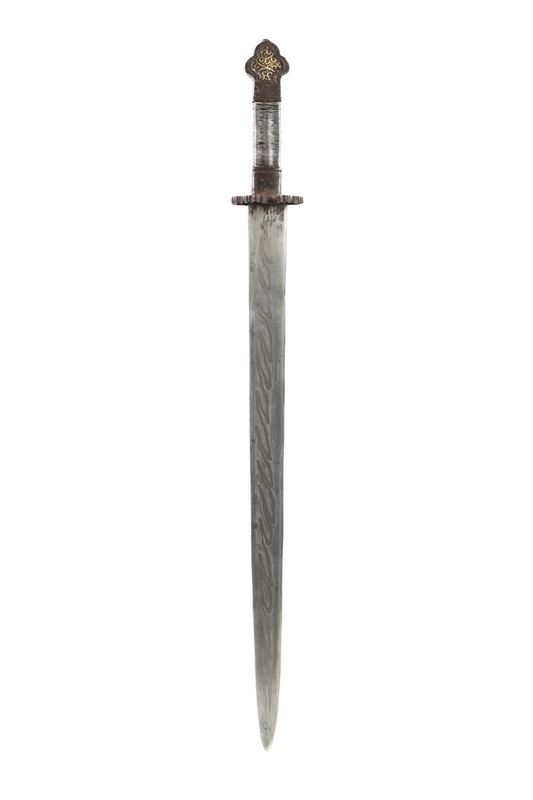 An antique Tibetan shortsword in classic iron mountings with a extremely rare blade type exhibiting a pattern called ce rong or "open ravines". Its mountings, rather unusually for this type, feature with brass plates with scrollwork in repoussé. 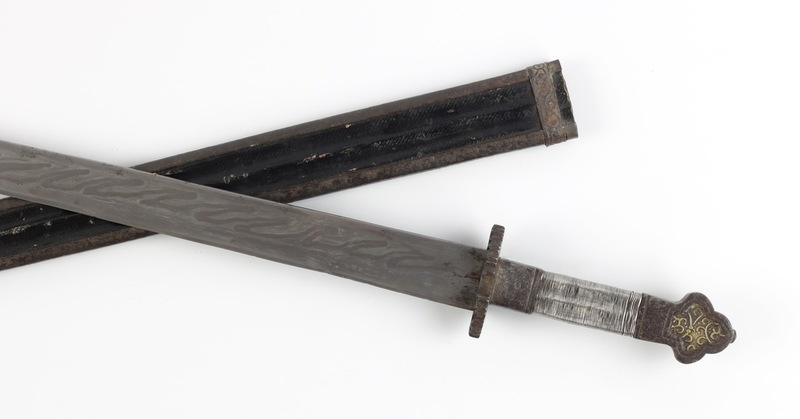 The blade cross-section hints towards an eastern Tibetan origin. 1. This pattern was drawn by Tibetan artist Lobzen Tenzin, published in 1968 and decribed by him as ce rong . Donald Larocca tentatively translated the term as "open ravines". 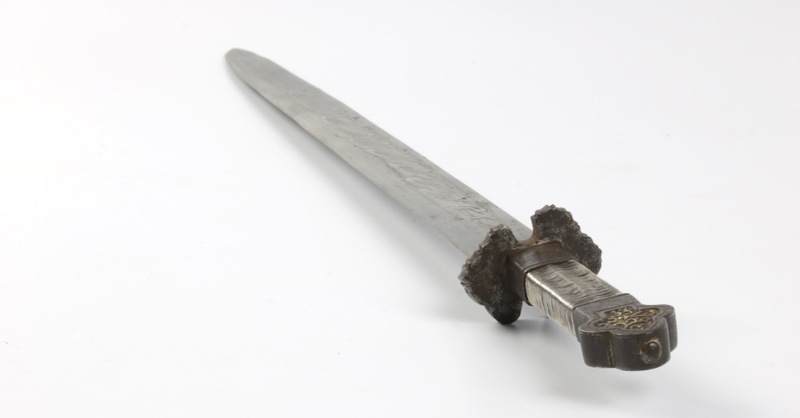 See Donald Larocca's An early Tibetan text on the connoisseurship of swords in The Armorer's Art: Essays in Honor of Stuart Phyrr , Mowbray Publishing, Inc. (October 5, 2014). Pages 89-105.